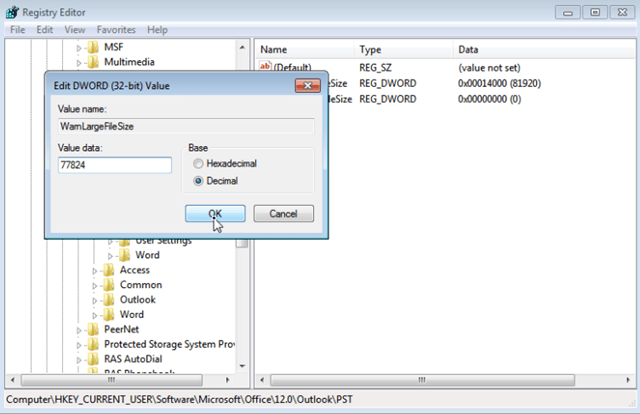 Fix Outlook 0x8004060C error during Send/Receive. 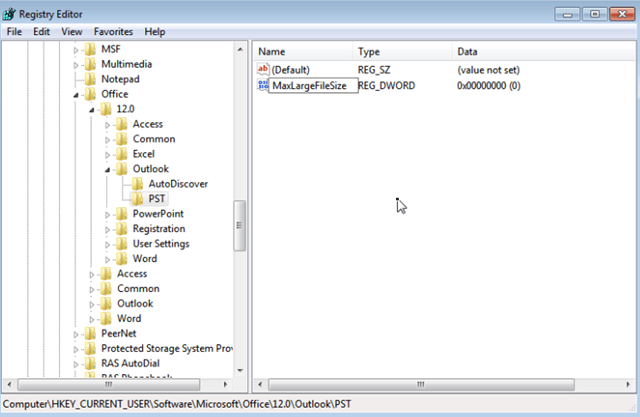 Outlook "0x8004060C" occurs when the Outlook PST data file (aka "Message store", e.g. 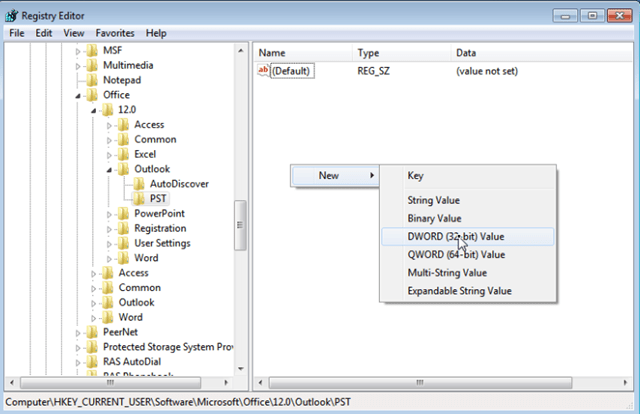 the "outlook.pst" file) exceeds the default maximum size limit. For example in Outlook 2007 the maximum size limit of the PST file is 20GB. If this limit is reached, then you will receive a notification error message during send/receive operation, that says "Task 'example@server.com – Receiving' reported error (0x8004060C): 'The message store has reached its maximum size. To reduce the amount of data in this this message store, select some items that you no longer need, and permanently (SHIFT + DEL) delete them.'". To resolve the 0x8004060C maximum limit error you have have the following two (2) options: The first option is to permanently delete (SHIFT + DEL) some email messages that you don't want any more (as the error 0x8004060C message suggests) and the 2nd option is to specify a new larger maximum size limit for the Outlook message store. 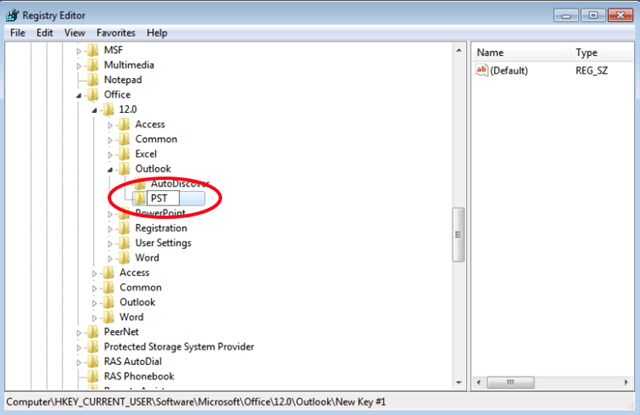 How to increase the Outlook's PST store maximum default size limit (Outlook 2003, 2007, 2010, 2013). Before proceeding to modify the registry, close Outlook. Step 1. 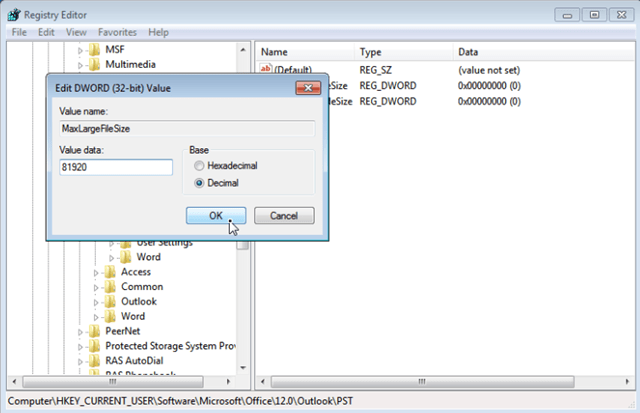 Increase Outlook's Message Store maximum size limit through Windows Registry. Note: If the above two values doesn't exist, then right–click at an empty space on the right pane and select New > DWORD Value. Give at the new DWORD Value the name MaxLargeFileSize & press Enter. 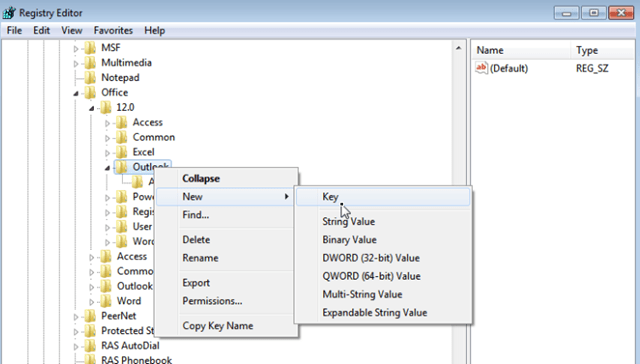 Perform the same operation to create a new DWORD value with name: WarnLargeFileSize. The Outlook 2003 & 2007 default message store maximum limit is 20GB, so you have to specify a size over 20GB. The Outlook 2010 & 2013 default message store maximum limit is 50GB, so you must specify a size over 50GB. 1GB=1024MB, 10GB=10240MB, 20GB=20480, 40GB=40960MB, 80GB=81920MB, etc. For example. If you use Outlook 2010 the maximum size limit is 50GB. So you have to specify a larger size e.g. 80GB. For accomplish this, you have to enter the number "81920" (without the quotes) in the Value data box. The Warning size should be the 95% of the MaxLargeFileSize value you entered before. For example: If you entered the value "81920" at MaxLargeFileSize, then the WarnLargeFileSize value should be: 81920 X 95% = 77824. 7. Finally open Outlook. The send/receive 0x8004060C error should be gone! « Remove Intelismart Webbing Ads (Adware Removal Guide)	» Hot to properly run the SYSPREP tool (System Preperation Tool). The instructions worked like a charm! Brilliant! Instructions worked for me, my donation is on the way thanks. your old messages has deleted? I did same steps but still getting same error. Joe S.: Are you sure that you created the key in the right location at registry? what will happen when it reaches 80GB now? Thank you. It works for me too. I am wondering too- what will happen when it reaches 80GB now? Follow all steps, still same error. At first try I was wrong (didn't follow the right steps!! This time I did correct: HKEY_CURRENT_USER\Software\Microsoft\Office\12.0\Outlook. Because PST didn't exist I follow the instructions to create PST as new key. New>DWORD value>New name MaxLargeFileSize + enter. Yes, the wrong keys were removed. I even have restart the computer. After have located the corrupted outlook data file (windows7) and press scan button I get the message "the file is used by an other application… close outlook and all others and start again… BUT NO SINGLE APP OR PROGRAM IS/WAS RUNNING… So I can't go further! PS. I receive emails on an other computer… perhaps I can contact you directly and transmit some needed data……. Gerdy: Perform a restart and then run scanpst without opening any program. If you face the same problem try to see if you can run scanpst in SAFE MODE. Restart PC, run scanpst, same problem "file used by other application…"
Outlook is running again after perform the instructions in SAFE MODE! BIG THANKS to you and lakonst2012 for patience, support and help! Thanks for the instructions. this has helped tremendously!! Outlook 2013: HKEY_CURRENT_USER\Software\Microsoft\Office\15.0\Outlook\PST <- I used this one. The PST folder already existed and in there was file LastCorruptStore. I did the MaxLargeFileSize and WarnLargeFileSize as instructed but it doesn't work. It still gives the same error “0x8004060C”. Any suggestions? it didn't work for me… is it because I am using ost instead of pst? wisam: No. The procedure affects both .pst and .ost files. This worked for outlook 2010. Awesome article. I am having same issues, but my outlook is 64 bit. Should I still create a DWORD (32 bit) or a QWORD (64 bit)? Yusuf: You must create a DWORD (32 bit) value. This worked for Office 365(2016), Thanks a lot, man. Excellent Thank you Lot! Its worked fabulous! Thanks for the useful Instructions!! Did this once and it worked perfectly. Got the error message again, tried to increase the size and it looks like I'm maxed out. Is there anything else I can do? p.s. Delete permanently the "MaxFileSize" value. Good afternoon, this error also appears when the Exchange server accounts are DISABLED … If it does not work for them, it may be for this reason. Thank you very much! You are a lifesaver!!!!! I love it. You have saved the day. I hope my kids grow up to be just like you! Thanks bro!it's worked buy unfortunately I don't have access to any money transfer or E-cards so please forgive me but your solution IS BRILLIANT!Keep up my friend! Worked perfectly the first time! I had to close outlook and reopen it then voila! Excellent fix. Worked great. Thank You for sharing! This is just awesome! thanks for the detailed article, worked fine for me. kindly let me know what to do for office 365 outlook with g suite. A kumar: The article was updated to include the Outlook 2016 & 365 versions.